Today, it announced some ideas to get things moving - starting with a change many users may not appreciate. Videos have autoplayed on Facebook’s News Feed for some time, leading to a curious rise of “silent movies” as publishers adapted to knowing that the majority of viewers would be watching, but not listening, to their work. But between now and the end of the year Facebook’s News Feed will be enabling sound on your News Feed by default, a move the company has been testing out on a limited number of users for a short while. The firm said it had received “positive feedback” so far. "With this update, sound fades in and out as you scroll through videos in News Feed, bringing those videos to life,” the company explained in a blog post on Tuesday. Thankfully - for those who don’t want videos to suddenly play out on the bus - if your phone is set to be completely silent, Facebook will not override that. You can also turn it off completely in the Facebook app’s settings. But data shows us that when something is thrust upon users as the default, they will mostly stick to it. It will likely change the style of many of the videos we see on the network. For some time now, publishers have realised that because viewers were probably not listening to clips, but just watching them, they needed to add subtitles as a way to draw people in. Publishers may well relish the chance to do away with that legwork. Subtitling is time-consuming and costly. 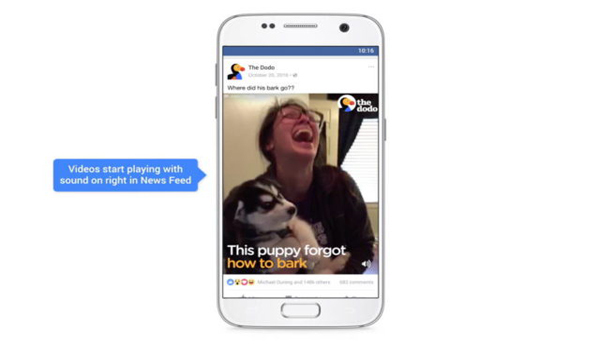 Facebook’s analytics tools go into great detail about how videos are performing, and so expect companies to be watching closely to see if they can now give up on subtitles.